On this section you can see some pictures of mammals, snakes, birds, insects who are the starring in our excursion. The Armadillo. 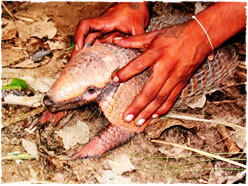 It's an small mammal, and eats fruts, roots, nuts of the jungle, but also it's the favorite food for the natives. 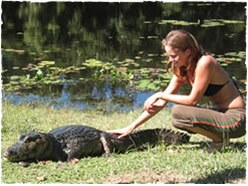 The Black Caiman is the biggest specie of the three caiman species. It measure 06 metters long. 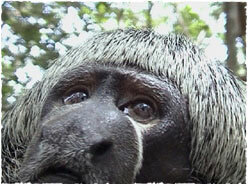 It´s also an exotic food for the natives of the jungle. Capuchine Monkey. It's the more commun monkey especie of the jungle, it's also the more friendly and domesticaly mammal, we reconize it for the beatuful sound or whistle. The Bird more comun and exotic called (tanrrilla) brazilian name Yazana. It's habitat is in all the banks or shore of the amazon river and it's tributaries, we can see this bird the first day, exploring the Amazon Basin. 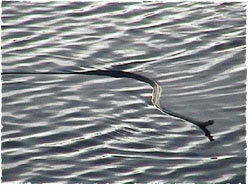 Water snake called (Yararáca) high poisson snake and very speed. It's habitat is the flooted lands, easy to see when they are migrating when the river is growing. 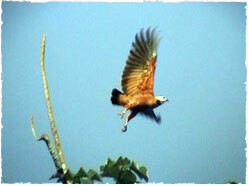 This is a bird of prey. It's called ipanemas brow howk. It flies all the time they are really speed and it eats fishes, snakes, rats, spiders snail. It habitad is on the shore of the river near to the Jurará River, where our excursion is realized. 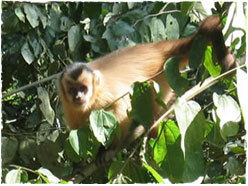 Old Monkey or Parahuacú hole monkey. It a mammal, his habitad is into the prime Jungle. 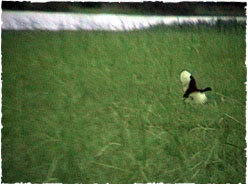 It's not easy to see, but we have been with good luck for catching this picture from our camp window. it loves eat the brazilian nut, palm tree fruits and many fruits rich in proteins. we reaconize it for the white hair and it comun screamming. Always travelling in group more than 10 monkays. The more exotic Bird of the Jungle called red and blue Parrot or macau. We can see this bird in all the Amazonian region it's habitad is in the biggest tree of the amazon called Samahuma or Ceiba. 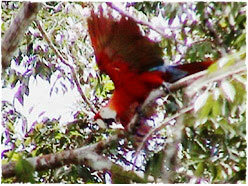 Easy to see them in the Jurará reserve, after mamory lake where we organize our jungle tour. It's a amazing Bird. 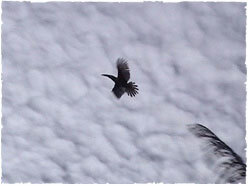 Long peak and misterious, so easy to watching during our Jungle tour, because these birds feed on grain, insects, dragonfly, it loves follow Clouds condensed wating rain for drinking quit the rain water. It's really spectacular. Piranas are the more agresive and the fish fater in the world to eat their prey. Has a good smell and are attracted to the blood. 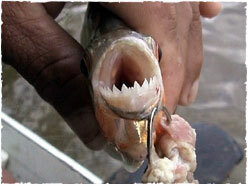 We can catch some especies of piranas or perharps the 06 especies from the amazon. It's fenomenal.